Got a booklet that you need printed? Then it probably needs some finishing done to it in the form of bindery. At Copy Central, we stock several different types of bindery options, and in many different sizes. Ask to see some samples of the binding options listed below. We even use a few binding choices not listed here, so feel free to ask us questions. 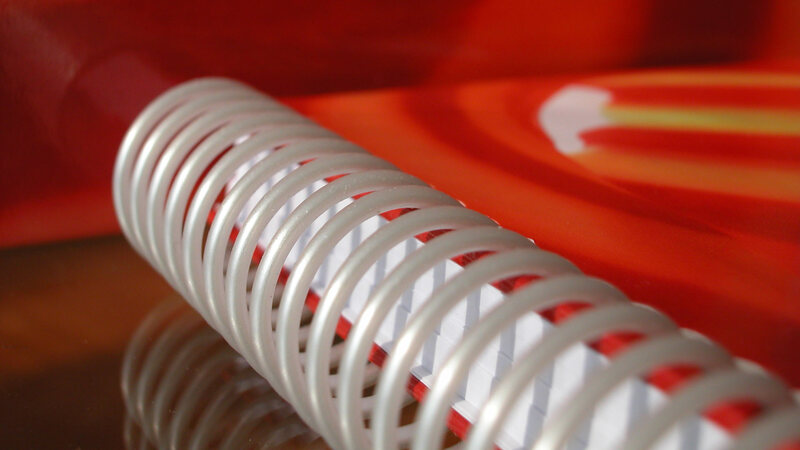 Utilizes a smooth round coil to hold pages together. Allows book to lie flat when open or pages can be turned all the way around to the back if desired. Wire is threaded through punched holes and then Ends are crimped to prevent wire slipping off. Spirals or coils are available in variety of colors. Economical method suitable for manuals and books that need to lay flat when open. Using rectangular holes punched through the document, the plastic comb?s rings are threaded through holes. Page edges at spine are covered by plastic comb. Probably the most common and economical binding method. Created by punching wire through the document?s outside spine, then bending the wire flat on the inside centre fold to grip all the pages. It may provide a similar look, but is not the same as stapling. Perfect binding is a method of bookbinding that is utilized for books, manuals, and magazines. Unlike some binding processes that require sewing the pages into the spine of the book, perfect binding requires no sewing at all. Instead, a water-resistant adhesive is used to hold the pages in place by attaching them to the cover of the document. Copy Central is proud to offer this service in-house, which many print shops can’t offer. Highly popular Wire-O option uses formed wire that threads through punched holes. This allows books to lay flat when open. Wire loops are available in variety of colours to coordinate with cover colour. A durable option for a wide variety of project types.